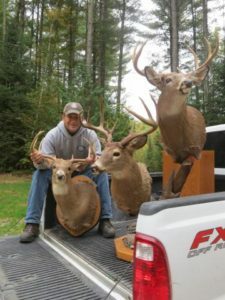 With lush summer vegetation and tolerable winter conditions, our deer numbers are climbing annually and we are beginning to get a peak into the “olden days” here in the mountains of western Maine. We saw a record number of big bucks this year while employing numerous methods of hunting the entire rut cycle. 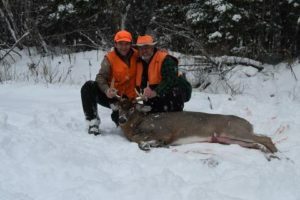 Tracking hunts were very effective due to early snow arrival, with three bucks and sixteen does seen within sixty yards just during the first week of the season alone. With a fully guided deer hunt, you can leave everything to us. We’ll arrange for your meals and transportation for the day/s you’re with us, and keep you in an ever changing environment – deer movement. Depending on weather patterns, deer movement and a host of other factors, we’ll sneak you into feeding areas and slowly still hunt, track, or stand hunt for a fair chase trophy of a lifetime – a true Northeast big buck. With choice stand sites on high volume travel areas and isolated staging areas, and a knack for getting into rutting areas that produce big bucks, your chances of tagging a fair chase trophy buck of a lifetime get better and better. 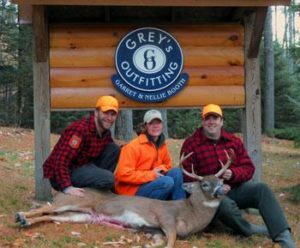 Depending on weather conditions and the development of the rut throughout the season, you may be in one of three stands for your three or six day hunt here in Maine. We’ll provide you with the know-how to get into your stand, and suggest different scenarios that will fit the deer you are hunting from those locations. Our stand sites are comfortable 15’ ladder stands with shooting rails when necessary as well as lightweight and comfortable Summit climbing stands. Shooting lanes are managed effectively for archery hunts, offering those “perfect” opportunities that leave the rest up to you. Trophy care and processing are available if requested, but are typically the responsibility of the hunter. To have a full understanding of your experience level to ensure that a semi-guided hunt is for you, we’ll speak with you regarding your ability in the woods that may include fitness level and medical conditions/restrictions. This is where we put the pedal down, leave the frills behind, grab some inner strength and a camp stove and head into the north woods of Maine to track down and tag a big woods buck. Drop off points will be dependent upon weather conditions, prevailing winds, predicted deer movement and other preferences we discuss with you. Carrying PLBs and overnight gear reduced to minimum weight by the ounce, we take on big woods bucks the way you’ve always wanted – fair chase remote wilderness hunting. Be prepared for a very dynamic, demanding hunt that will test your fortitude in more ways than one. We may find ourselves keeping an eye on a mountain top saddle one morning or traversing that same saddle later in the afternoon locating tracks on a fresh snow. Either way you play it, we’re right in the middle of the action the entire time you hunt. No travel time, no bar scenes, just you – and him.